Interviews are conducted to get the information from the candidate and to check whether they want to directly involve or not. It also becomes a great way for the candidates to understand and create a genuine relationship with the organization. It facilitates how the interviews are assigned. Interviews also play a vital part in building the organization. They provide qualitative data enriched with the key that the stakeholders use. Here are few interviews that need citation. These interviews are conducted by the employers that need not to be recorded on video or audio devices. After clearing all the technical barriers the candidate may feel confident infront of the interviewer. A personal interview can be cited by different methods. It can be on telephone, email, one on one meet and by a third person. These will be generated with date and type of personal interview. These interviews that have been broadcasted live are said to be recorded both in video and audio channels. It is initiated with the name of the interviewer. It also includes the publications that are cited for the interview. This means when the interview has been broadcasted or published will be cited for the other context also. This becomes as a source for the person to define the information straight from all other original sources. It enumerates wide range of the conversation of the candidates and even the writers. It has maximum of the humanity researches within the broad-level narrative perspectives. It has its own format of conversing over the telephone or by video call. These interviews are something that are not conducted face to face but has continuous back and forth responses and questions. These interviews are kind of response that are continuous and structured within the savable digital text. This interview system is better than an email interview. It is better equipped with motivational words of the interviewee who attends interview. Here the way of composing and recomposing is needed. Even though it is done on face to face, the interviewer analyses the time that is taken by the candidate to respond. It might vary spontaneously and one cannot read the facial expressions. The process of citing involves the paper text and the paper extracts that are serialized in the appendix in email system. Why Do We Cite Interviews? 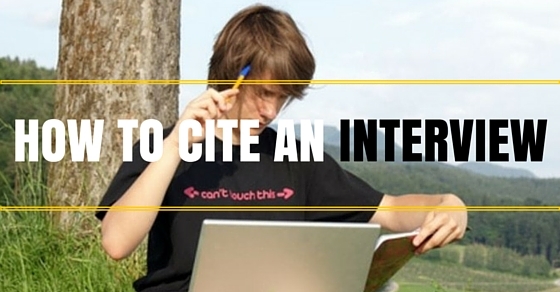 Citing is done to acknowledge the work of other interviewers and to quote it without plagiarism. Demonstrate the language in which the content is cited. It also enables the resources and the searches that are eligible for tracing the alternative choices of other interviews. It also helps in collecting other information that is traced on other resources. It ensures the further information that is modified based on easier system knowledge. It represents the literature and bibliographies of other methodologies. Citation can be done using multiple paper works. It has huge volumes of writings and publishes so that the candidate or the employer can understand all the process of citing an interview. It also has special completed collected works of the other interviewers. It will also have a proper method of citing the interview based on the related interview designs. It organizes the related data for the usage of others. It prepares the collected data that are managed within the other interview process. The principle behind citing the internet resources can be defined with the traditional printing of all the other systems. It modulates all the varied parts of the title, publishers and the authors. It has different fields of inventions that are managed within the serialized documentary resources. It has a complete content of all the other resources that are unlike the other print resources. It can be accustomed to other dealings of the other URL pages of the same company. Identifying the background resources will help in the essential part of the resources and knowledgeable books and other authors of the same sources. It modulates the correct and sequential flow of citing the interviews. It defines the average resources that are under the identification of background resources. It is credibility of all the resources. These are too seen to identify the resources that are modulated under the resources. It sequences all the provided resources. It evaluates similar resources of the advancements. The related point in the identification of interviews is to be calculated as to define the academic research by an identifiable name. It usually has the real name of an individual. It is also known as anonymous interviews that are either referenced through certain resources or considered as an acceptable academic research. The point is to identify the interviewees to match all the information within the argument and the principles that are not directed. Based on some of the exceptions citing the interview can be carried out. Using colon between the years and the page numbers is important. Common punctuation in the author names are expected. This has to be handled the way in which the text appears in all the references are handled. It specifies the advanced time along with the citation. It has each and every site for interviewing. This maximizes the possibility of citing the other reference resources. It must enable all the other reference resources. If a quotation is found to be running more than four lines then it is advisable to use block letters and brackets as citation for the end of a block. It italicizes the title in text referenced by the end of the block. It has most of the considerable amount of all the sequences. They must also include page numbers. Use only the references list of work that is recommended. Usage of references at the end of the block is also accepted. In case if the recordings are made either in unpublished way or public way the archived webcast must be defined as the referable resource as it is the source and the content of the interview that is defined and even not applicable publicly. It also shows the disputes of the intermittent data that is actually explained in a certain way. Here is a recording to be consulted in a certain way. Broadcasting certain interviews includes the title and the name of the interviewer. It has different title along with the publications and even the number of interviews that the candidate has appeared. If the interview is untitled then it means the interview has been cited earlier. The interviews that are published will usually have print citations that will include extra features, interview publisher’s name. Anthology used while interviewing, editing and the publisher’s record. Each interview can be defined in such a way that it will provide evidences of new and original writing. It appeals to the experts and to the other authorities to either agree or to disagree. Improving the vocabularies during cite i.e. to cite the structure of each word that is either heard or read can be done. Here the credited and acknowledgement is necessary but it should be along with the significant contributions. In each interview paraphrasing each ideas and words must be cited as to define the words and ideas of authors. It has to indicate the quoted text and even where the text comes from. During the process of citing one must keep in mind the intellectual property belongs to other person. Acknowledging the resources is more important while citing the interview. In case if the person needs some clarification then he/she must try cite the sources where the data is gathered from. This citing information will include the author and the data accessed by the other URLs. It must have different types of resources that are managed within the online journal articles. It will depend on the homepage and the websites in more general. PDF of other online citing sources should be visited. And also one must try to cite the thesis about the organization. Personal interviews that do not have page numbers must be added to the end of each sentence. The words should be double spaced and intended. Listing the interview by the name of the interviewee will help one to do proper citation. The point to be remembered is to examine the scholarly defined interviewees. It has all the principles and also the academic arguments. It aims at freely and openly defined researches that follow certain principles. Primary sources in each and every interview must be discussed by the supervisor and also be more confidential even while discussing with the people who handled it such as supervisor etc. It should be added in the last to the appendix and not to the bibliography. While conducting huge number of interviews one must not forget to include the appendix of the previous sections of interviews. For example it can be as Jewish, S. Personal interview. Cited on 23 July 2015. One has to collect references on the data formatted and even on the words that are chosen. It has different bibliographic styles of one’s personal choice. It has its own italicized titles that are along with the initials included. One can look for the italicized words and even the precedent choices that are managed within the selection process. It has all the discipline and be consistent with that of the hard work and even the end note. More than 3000 bibliographic styles are used to write EndNote about interview. It includes Chicago that involves common histories and natural sciences. APA that is abbreviated as American Psychological Association consists of psychology and the sciences. It also corresponds to MLA that is Modern Languages Association for literature and the other languages. During citing a interview, the process should include communicator’s name, fact as the personal communication and also the date of communication. One must not include personal communication in the reference list. The person should check for the citation format and the contexts on it. If it is published/ broadcasted interview then the format should be as last and first name of the candidate. First and last name of the interviewer should me mentioned. Publication information about the interview and the Medium used should also be attached. Citing the personal interview can be done personally. Here the name of the person should be reversed. It has the Roman numeral and also the suffix that appears as a roman numeral. It has the title and the name of the interviewer, mode of interview, period of interview and the publication. If incase there is no title then one can use the title as Interview. To conclude the citation one must include the medium of publication as the type of interview. Generally, for all the type of interviews the process of citation should quote, name of the interviewer and the duration. For an unpublished interview one must include “Interview with” followed by interviewer’s name. It also includes location and the end of citation period. The work that is cited should have respective description rather than supplementary documentation.